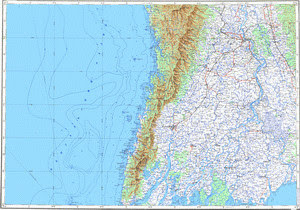 You see a map that displays territory of Myanmar. city Pathein for Garmin. On this map city Hinthada for Garmin. On this map city Bogale download for free. On this map city Pyapon presented. city Tharyarwady download for free. Displayed city Kyaiklat presented. You can find here city Maubin marked. Displayed city Twante download for free. Displayed city Wakema free download. You can find here city Nyaungdon for Garmin. You can find here city Mawlamyinegyunn for Garmin. city Letpandan free download. Zwetki for Garmin. Displayed Zwemu free download. Zwekadein presented. On this map Zwedaw for Garmin. On this map Zokkani presented.